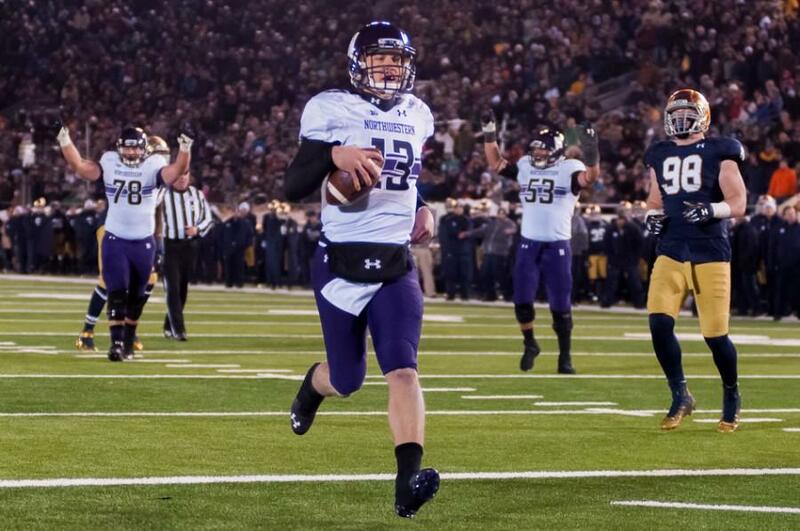 Senior quarterback Trevor Siemian runs in for a six-yard touchdown in the fourth quarter. Siemian looked as mobile as he has all season, throwing for 284 yards and running for 32 in Northwestern's 43-40 victory over No. 18 Notre Dame. SOUTH BEND, Ind. — Northwestern had its most roller-coaster offensive performance of the season Saturday in its 43-40 win over No. 18 Notre Dame. The Wildcats overcame freshman running back Justin Jackson’s first career fumble, three potential dropped touchdown passes by senior receiver Tony Jones and a glut of other miscues to post their best yardage and points totals of the season. While Jones was far from alone among players from both teams in failing to hold onto the ball, his drops were especially egregious in that they ruined some of the best balls senior quarterback Trevor Siemian has thrown all season. Siemian, NU’s signal-caller, was able to overcome it and have easily his best game of the season, even if it didn’t all show up on the stat sheet. Other than the drops, which have been an issue all season, everything finally seemed to click for the Cats on offense. “This is probably the healthiest (Siemian) has been since he got hurt in the Northern Illinois game,” Fitzgerald said. The Cats threw early and threw often, mirroring the sequences that saw them mount a late comeback attempt against Michigan a week ago. NU also finally exploded for some big plays, recording both its longest pass, a 60-yard catch-and-run to junior wideout Cameron Dickerson, and longest run, a 45-yard scamper by senior running back Treyvon Green, of the season. The Cats’ pass-catchers did a much better job of creating separation and getting open, but it all started up front with the offensive line. Ten games into the season, NU has finally figured out a successful offensive formula. On Saturday, it was finally enough for the Cats to salvage a shot at postseason play.